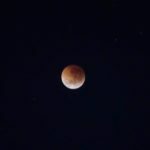 My morning began early when I set my alarm to get up at 4am to watch the once in a life time complete lunar eclipse which is the longest of this century. I didn’t expect to see the Moon as there was cloud cover when I arose but thankfully disappeared. The eclipse is called a Blood Moon because the light from the Sun goes through the earth’s atmosphere on its way to the Moon and the earth’s atmosphere turns it red in the same way that when the Sun goes down it goes red. It lasted for 42 minutes and 57 seconds and was pretty amazing. A bonus was seeing Mars which is at its closest to the Moon now. The next Blood Moon will not occurred until June 9, 2123 but it won’t be visible in Australia.